Rare Wegener arcs imaged by Marcin Polkowski in Poland, June '08. ©Marcin Polkowski, shown with permission. The bright white arc is part of the parhelic circle at the 'anthelic point' opposite and at the same altitude as the sun. Two faint arcs form a cross at the anthelic point - Wegener arcs. 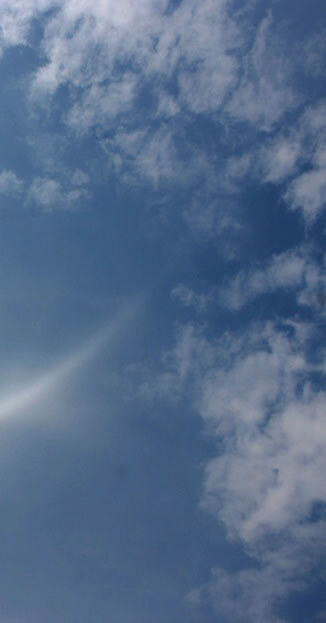 The arcs are formed by column crystals drifting in cirrus with their long axes horizontal. Wegener arc rays pass between prism sides inclined at 60° just like the rays that form the much more common circumscribed halo and (at lower sun) the upper tangent arc. The critical difference is that while inside the crystal, Wegener arc rays are reflected once from an end face. All the halos in the all-sky HaloSim ray tracing (with the exception of the faint 22° halo) were made by horizontal column crystals. HaloSim's virtual crystals are perfect. 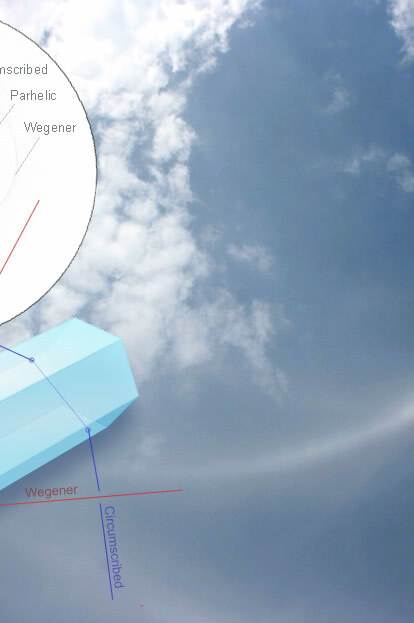 In the real sky, Wegener arcs need relatively short crystals with near perfect end faces. End faces are most prone to imperfections.